This is the first study of a Victorian churchman and biblical scholar whose name is well known but whose significance is generally misunderstood. 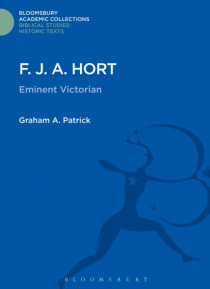 One of his contemporaries described Hort as 'the greatest of all our names', not primarily for his work as a textual scholar but for the quality of his theological thought on the controversies of the day, like Christian socialism, the question of eternal… punishment and the Darwinian Controversy. The book makes an important and interesting addition to our knowledge of the Victorian church and the intellectual circle in Cambridge in the late nineteenth century and is a sympathetic but not uncritical portrait of a late-flowering Renaissance man, who was philosopher, scientist and historian as well as biblical scholar and theologian.